The Lumigon T2 HD is a sleek high-end Android smartphone with NFC. 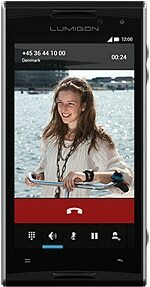 The 4G LTE handset runs Android 4.4 on a dual core 1.7GHz Qualcomm Snapdragon processor and offers a 4.3-inch 720p display. The T2 HD is waterproof and dustproof, with an ingress protection rating of IP65. Premium audio from Bang & Olufsen rounds out the offering. The device is a successor to the Copenhagen-based boutique phone maker’s well-received Lumigon T2, which was announced in early 2012. The Lumigon T2 HD was announced on 27 March 2014 and will be available in black, white and a limited edition in 24-carat gold with 32 GB, 64 GB or 128 GB of internal memory. It will be available at retail “during Q2 2014,” starting at €730 (US$1,000).